Muslims found to have statistically significant underrepresentation in cases of family-related violence with women resulting in a fatal outcome in Sweden. Clarification: Professors Blogg is a Sweden-based independent blog devoted to Human Rights issues. These columns have recently devoted considerable space analyzing the Swedish case against the WikiLeaks founder Julian Assange. The opinions expressed here are solely those of the authors of their respective articles and are in no way affiliated to WikiLeaks. It is a mildly warm sunny Sunday in Bergamo, in Northern Italy. I have finally made it home after three days driving through sinful gastronomic pauses in lovely Germany, at the villages faithful to tradition. The golf Spring-season has started in the most auspicious way. Sitting outside for pranzo at my dearest friends the Loreschini we enjoy the view of the Golf green surrounded by aesthetic forests, the sensuous hills and the fraganza of the lavender. Another old friend also invited is the former Major and wife, who have come earlier with a welcome present for the recently arrived player from Sweden. I found their present in front of me, at the table. I can hardly believe it; it is a bottle of Brunello di Montalcino! Chianti’s absolutely most exquisite wine. It will cure me of all health endeavours, they say. Will do, I say. It is 1st of April, and we start telling all the jokes we have heard that day. We have some good, hearty laughs. And then when they end we go over the jokes worth of remembering from previous years. And it gets even better, but soon we have no more jokes left to recall. Nonetheless the Chianti still waits to be finished. Suddenly - illuminated by need – I say, “I have another one”, allowing myself to pour the nectar in our glasses. And I tell about what I have read that morning on some troll in the Internet. I used an illustration from the classic historical episode, quite well known by Italians (and elsewhere) as the Pyrrhic Victory, to quickly explain the context. This referred to the Roman/Greek war of 281-275 BC. Namely, when the Helenic General Pyrrhus invaded Apulia in 279 BC he defeated Consul Publius Decius at the Battle of Ausculum but at the price of suffering extremely heavy loses. The actual number of Pyrrhus’s soldiers that perished is not exactly known, some say n= 3,000 (estimation A), and others n= 3,100 (estimation B). This among N= 40,000 troops. One research author, a PhD, have used estimation A, and obtain 7.50 per cent of loses. But an enthusiastic amateur has chosen instead estimation B and obtained 7.75 per cent of loses. And then the amateur concludes that all those PhD obtaining value 7.50 “cannot do research”. Of course my friends – also familiar with research statistics - got the joke of the month and laughed strenuously. For does any statistically significant difference exist between those two estimations or with regard to the historical affirmation Pyrrhic Victory in the context of extreme own loses in battles of the period? We finished the gossiping and went to the terrace where the women were smoking fancy cigars and talking politics. I estimate the representation of honour-killings being only 0.3 percent among all the killings in Sweden in the period 1991-2011. Now, attending to the alarming notion that the Muslim honours-killings in Sweden would be extraordinarily “many”, and attending to the highly publicized warnings issued by the Swedish government, the Swedish Police Authority, and the Development Centre of Gothenburg - an institution of the Swedish Prosecution Authority led by Chief prosecutor Marianne Ny which published the document "Honour-related violence. Manual"-, the two foremost questions in the epidemiological comparison would be: 1) Are Muslims overrepresented in the Swedish statistics of family-related violence with fatal outcome? And 2) In that case, is there any statistical significance for such overrepresentation? The Muslim population is estimated to be 5 per cent of the total Swedish population. Expected cases in the table above are based on the estimated representation of Muslims in the total population of Sweden (5 per cent). Chi squared equals 10.095 with 1 degrees of freedom. The two-tailed P value equals 0.0015. This result is normally written as (X2=10.095, d.f.=1, p=0.0015). The hypothesis was that there is a difference between the actual and expected family-related violence resulting in death rate by Muslims. The null hypothesis is that there is no difference (observed and expected are the same). The statistical test shows that the null hypothesis must be rejected in favour of the hypothesis that the observed and expected rate is different. The only two possibilities are that the expected rate is either an over- or underestimation. Because the expected rate is higher than the observed rate, the correct answer is that the Muslim population is over-represented in expected rate.By conventional criteria, this difference is considered to be statistically significant. Any one can repeat the calculations above. Muslims are underrepresented (statistically significant result: (X2= 10.095, d.f.= 1, p= 0.0015) in the cases of family-related violence with women resulting in a fatal outcome in Sweden. 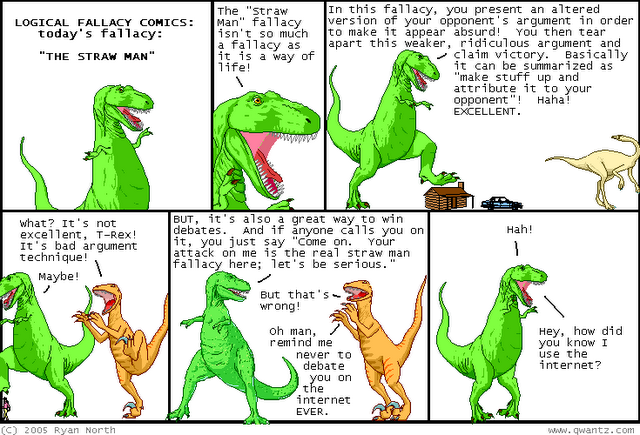 Now, what is the Straw man fallacy? And what is scientific research and what is amateur-troll garbage? In the first place it has to do with academic research education, scientific credibility, and published results in international scientific journals. This is one reason why trolls cannot have entrance in the real scientific world, where all publications are to be peer-reviewed. Also, I have warned in these columns about the questionable scientific value of some studies conducted under the so-called "qualitative research" method. I refer here to those research designs been made rather to correspond to the investigator’s biased notions about the subject under study. In my article "Extreme 'feminism'. What is scientific research and what is not" I illustrate by which means these designs lead to non-relevant, non-valid or non-representative results. Nevertheless, I agree that unprejudiced qualitative analysis can be of great value, and that some such studies would even complement empirical findings, and vice versa. In the second place a Research Ethics Committee should approve research projects. There are varying standards for such committees. Personally, I assessed that the Swedish Ethic Committee in Uppsala does not apply international standards in judging certain research applications. For instance, the one from extreme “feminists” Eva Lundgren and Jenny Westerstrand based on biased in cultural-racist notions of a pretended overrepresentation of Muslims in close family killings, questionably categorized as honour-killings, in Sweden. In order to be able to publicly denounce this anomaly I have resigned from the assignment I had from the government as scientific member of the said committee. This article is one outcome of that decision. In the third place, in the world in which I live, authors have to deploy good manners, behave in a civilized fashion and with decency. No ad-hominem insulting troll can ever expect his/her vulgarity to be answered or referred to with name or respect. We do not exist to give trolls shouting in the wilderness any legitimate platform or publicity. I have received many friendly emails and calls since I arrived to Italy, all of them in kind support when mentioning the nasty personal attacks since Professors blog has been targeted by the trolls. However, I suddenly started to reflect that some further sneakiness – beyond the ad hominem insulting - was afoot in those attacks only after I received an emailed supportive letter by a former colleague at Harvard Medical School. She referred to my resignation to the Swedish Ethics Committee and recalled that none of our colleagues of that time, including myself, had before sustained outside or on the Internet such personal attacks due to our opinions in matters of science or Human Rights. And since I had not initiated any attack to any one (actually I have never mentioned these people at all in my articles), she suggested I should try to look beyond the assaults as such in understanding its motivation. The very same trolls are now writing on a daily basis outrageous personal attacks against contributors or the publisher of Professors blog. They have called feminist Naomi Wolf “shrill and weak”, Traci Birge a “racist”, and preposterously accused me of personally supporting honour-killings in Sweden or that “he has himself might have honour-killed some one” and that is why “he opposes the help of the killing-victims”! I agree – as I wrote today in reply to a friendly message - that these attacks should not be given attention in the personal level. In normal circumstances I would have dismissed it. However, by long political experience, I sense that these attacks are ultimately targeting me only "by proxy"; the real strategic objective being the eroding of Julian's cause of justice and the societal/historical prospective of WL, by trying to associate them with inexistent positions the trolls in turn attribute to some supporters. 1. They say they are supporters of Julian Assange, whom himself for obvious reasons is not taking part in all this type of discussions around the Swedish case against him. 2. At the same time the trolls attack and smear key figures taking part in such discussion defending Julian Assange. The trolls have smeared one after the other including John Pilger, Bianca Jagger, Michael Moore, Naomi Wolf, and now new academic contributors to Professors blogg, such as Traci Birge. Even human rights lawyers Jennifer Robinson and Gareth Pierce have been subject of injurious statements or innuendos twitters. 3. One of the most self-evident demonstrations/attestations of the agenda of these trolls is that the trolls have never analysed nor mentioned in negative terms those authors, politicians or journalists targeting Julian Assange. The trolls are “obsessed” in attacking Julian Assange defenders --particularly those who present thoughtful, fact-based analysis of the handling of the case. Is that not self-revealing? 4. Another inconsistency of the trolls is that they demand restraint-politeness they say-in dealing with those attacking WL and Julian Assange, but they are implacable in their mistreatment, insults, and defamation of others without any regard to ethics, good behaviour, or comradeship. 5. The rest of Assange supporters, as also WL, even if they may have their own critical reflections about all, or even own experiences of being harassed by these trolls, would do well not to react publicly. Rather, read the facts for yourselves and expose the fallacies of these trolls to those who might not have the time to understand their agenda. Do not be fooled by them calling themselves “WL supporters”. 6. Significant in their activities and the duplicitous game they are playing is that these trolls, in languages not to be understood by Julian Assange or the international WL community, attack JA in Sweden – in Swedish - by harshly questioning his credibility. 7. The trolls are able to fly from continent to continent, to move from country to country when and wherever happenings around the Assange “process” is in focus as a result of the extradition legal tours. At the same time they allege not having economic resources of their own, which permit the trolls to access lodge and shelter in intimate circles of Assange supporters and infiltrate the WL ranks (they do present themselves as Assange supporters). 8. A most important feature: the trolls’ arguments contained in the smear lack consistency. If they finally are exposed in the inconsistency of the argument they will not insist but simply change the argument; they will “mutate” according to the smearing needs. For instance, when one troll could not any longer proclaim that Professor blogg was attacking “Swedish feminism”, the troll changed the argument to “Professors blogg attacking the Swedish women”. This in conjunction with the fact another troll announced a campaign to discredit Professors blog on the “reason” of their “anti-Sweden stand”; an issue treated in Disclosing The Fifth Column. 9. The above means that the discussion agitated by these trolls is a FAKE discussion, and therefore useless to engage. It is not about “discussing” opinions; it has never been; in my opinion, it is about smear against those that are viewed as valuable defenders of the cause of justice for Assange and WikiLeaks. “Crazy”, Agenda driven, or just mean? I was initiated into the actual diagnosing of psychiatric disorders during my research training at the Karolinska Institute. Corresponding to the Course-block Psychiatry there were daily clinical duties (klinisk tjänsgöring) in the form of “medicin kandidat” internship. I was assigned to the Psychiatry Emergency Ward at Huddinge Hospital, were psychiatric diagnosing was a central activity. All kinds of cases of reported or suspected pathology were assessed at entrance. It was my first introduction to the understanding of what would be with the years the "Troll behaviour" phenomenon in the Internet political debate. It does not really matter if that fixated behaviour would be based in a sort of mental disorder or delusion, or if it is instead a rational calculated activity according to an assignment, or to an own agenda, or if it is a manner to increase the price of a ransom after tried blackmailing the target --as it was also in the case of Professors blogg. No matter the motivation - criminal or not - the dire consequences of such behaviours for the target organization is the same. In the beginning it may cause some degree of confusion or harm, but it will always conclude by turning back its consequences to the perpetrator. I recommend all such attacks be reported to the police; at least in Sweden, as well in Italy, such defaming attacks and offensive expressions on individuals constitute a criminal act. In Sweden is called ärekränkning, according to the Swedish Criminal Code, 5 kap. 1 § Brottsbalken. And with that I put and end to this episode. From Professors blog’s part, it is now crystal-clear that whatever the arguments the trolls put forward about us even in the future, their credibility is as exposed, totally gone. Legal issues remain. 1999 - Mordet på Pela Atroshi (kurd (Irak)). Mordet begicks fysiskt sett i Irak, men inom en i Sverige bosatt familj.